Congratulations to Dr. Ben Bond-Lamberty, terrestrial ecology scientist at Pacific Northwest National Laboratory. He received a 2016 Editors' Citation for Excellence in Refereeing as a reviewer of submitted papers for Journal of Geophysical Research (JGR): Biogeosciences. Bond-Lamberty works at the Joint Global Change Research Institute (JGCRI) in College Park, Maryland. JGCRI is a collaboration between PNNL and the University of Maryland. JGR: Biogeosciences is a journal of the American Geophysical Union (AGU). Established in 1919, AGU is a nonprofit organization of Earth and space scientists with more than 62,000 members worldwide. Bond-Lamberty's research focuses on carbon and nutrient cycling in terrestrial ecosystems. He researches disturbance effects, ecosystem stress on forests, and ecosystem respiration. 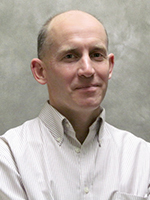 He serves on the Environmental Research Letters Reviews Editorial Board and Plant and Soil editorial board. He also is a section editor of the journal Public Library of Science (PLOS) ONE. He got his PhD in forest ecosystem ecology from the University of Wisconsin-Madison in 2003.